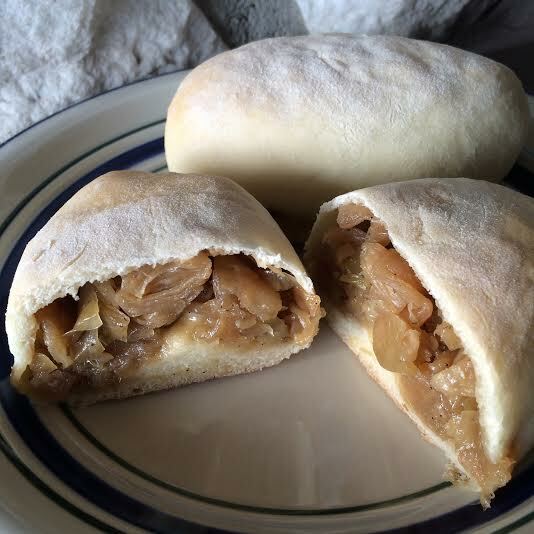 My Grandma Kyle used to make these delicious little bundles every time we came to visit. She called them "gullywugs". I don't even know what that means, or what the real name is. I assume it is one of many random made up words that seem to be a part of my family. They are such a simple food. 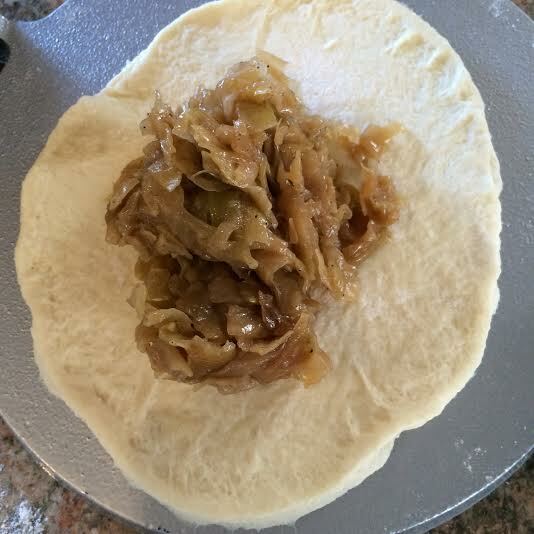 Pairing cabbage and onions and slow cooking them for hours give a caramelized little delight that tastes a lot better than it looks! -Remove the tough vein from the bottom and center of the cabbage, and coarsely chop the entire cabbage either by hand, or in batches in your food processor. -Measure the oil into a large dutch oven or heavy stock-pot. 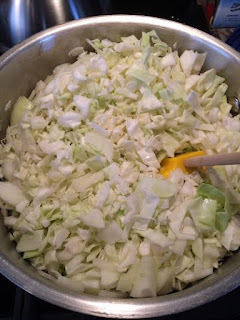 Add the chopped cabbage, sliced onions, salt and pepper to the oil, and stir thoroughly to coat. The pot will likely be VERY full! Don't worry, it will cook down. 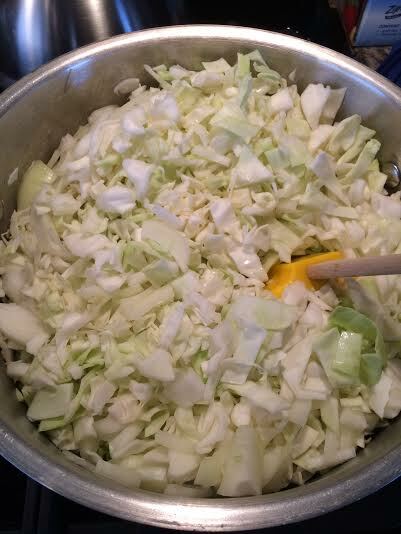 -Continue cooking the cabbage over medium heat, stirring every 5 minutes or so, until the volume is reduced by about half. (This usually take mine about half an hour). -Stir in the brown sugar, and reduce heat to a very low temperature. Cover, and allow to continue to cook down and caramelize for approximately 2 hours, stirring every 20-30 minutes. It will end up being a rich, golden color. Remove from heat and allow to cool to lukewarm. -Dissolve sugar in the warm water, and sprinkle yeast on top. Allow to sit for about 5 minutes, or until foamy. -Add canola oil, salt, and 1 cup of the flour. Whisk until smooth. Add the remaining flour, 1/2 a cup at a time, until the dough comes together and pulls away from the bowl. 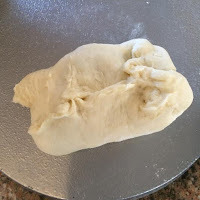 -Knead for about 5 minutes, until the dough is smooth and elastic. Cover with a clean towel, and allow to rest for 10 minutes. 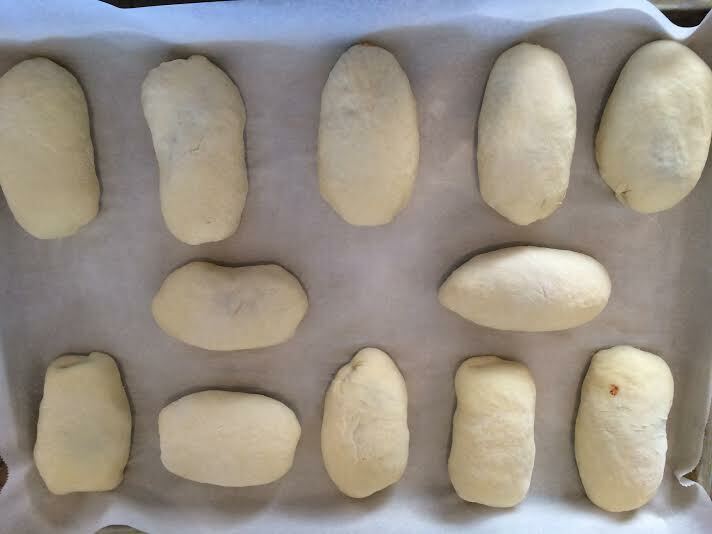 -Divide dough into 12 equal balls. Roll each into a circle, about 6 inches in diameter. Scoop about 1/3 cup of filling into a rectangle in the center of each circle. Fold the edges over-top of the filling, making a little log. Pinch together to seal. -Place each bundle, seam side down, onto a parchment lined baking sheet. Repeat with remaining dough and filling. -Bake in a preheated 375F oven for between 30-35 minutes, until golden brown. Allow to cool until just warm to the touch and then transfer to a wire rack to cool completely. Store in an airtight container in the refrigerator. Enjoy!